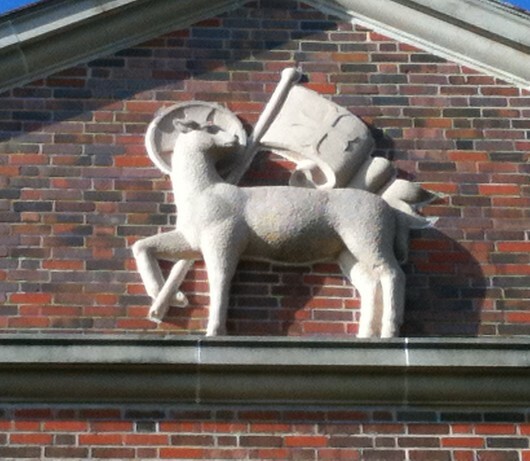 This page is for those of us and for new people who might wonder about some elements and features they see in and around the church building itself. What is it? What does it mean? Why is it here? Hopefully some of those questions can be answered in this page. The North Sherman entry became the most used entry during the week due to the location of the church offices and the mailing address. The entry halls there were blank and dismal. 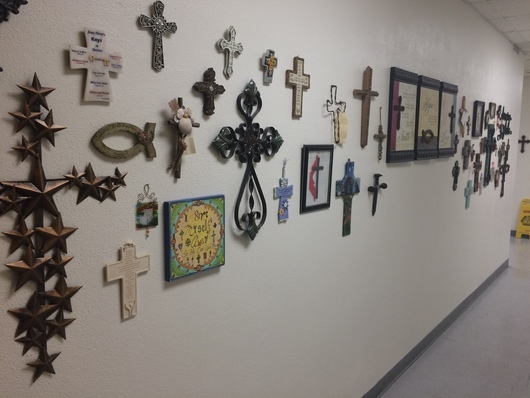 A Sunday School class suggested we start a wall of crosses. 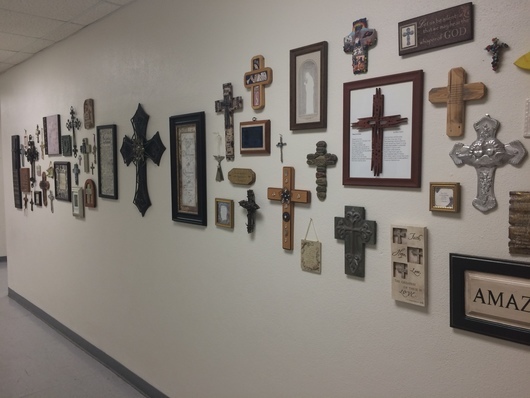 Members of the church were invited to donate a cross or object of our faith to be placed on the walls. Marcey Norman took on the responsibility of placing them appropriately on the walls. 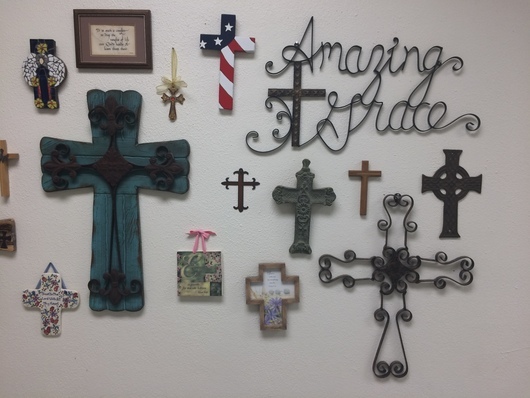 Well, these walls grew and grew with unusual objects of art and faith. 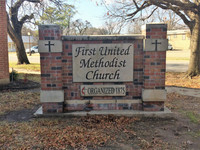 Now, the entry to our church looks and feels more like a church than ever before. Thank you everyone for your participation. 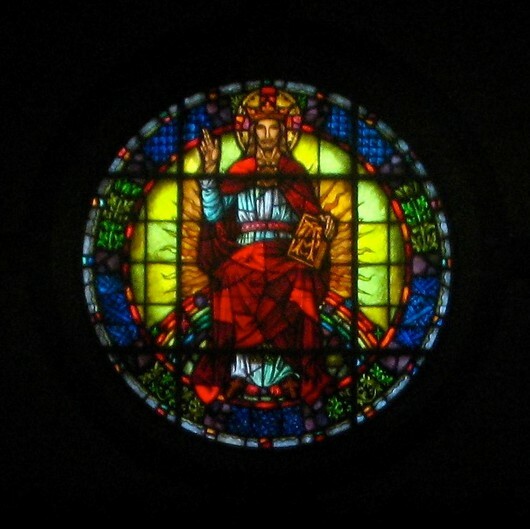 The round window at the head of the Sanctuary depicting Christ the King is one of the most significant and remembered features of our church. At one time, the lighting on the outside was of such that the window would be lighted on the inside at night, as it would always be in daylight. Hopefully one day that lighting installation can be restored. 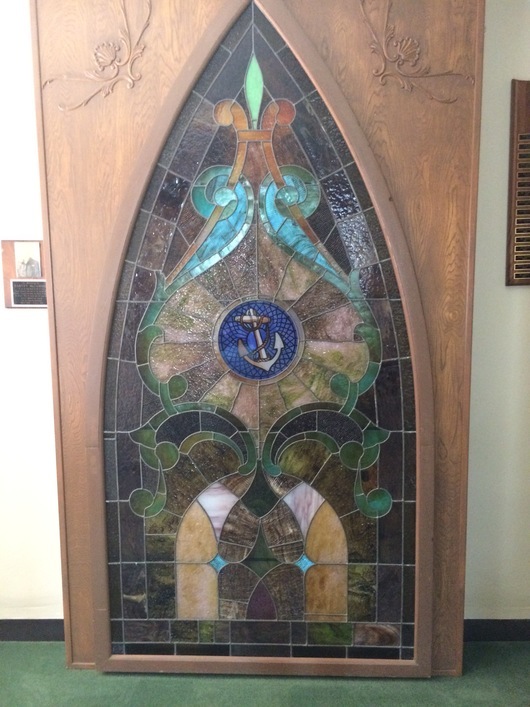 The Anchor stained glass window just outside the Sanctuary is from the old Methodist Church that was located at Dallas and Crockett Street. That church was the Methodist Church in Ennis just before this existing building was built. This window was found in the basement of the church in the existing building on the floor under water. It was found by the Boy Scout Explorer Sea Scouts (who met in that basement location) led by Skipper Guy Weathers in the late 1950's. The church commissioned Joy Russell, local stained glass artist to restore the window. Member Harvey McCammon designed and built the wood frame box for the window so that it could be lighted and attached to a wall in the church.